There was a size 2 in the rack that I tried on and it fit perfectly! There’s a little elastic gathering in the back which gives it just a little stretch. The neckline is a V’neck, but modest enough that you don’t have to wear a cami underneath. Also, since it’s a shirtdress, a collar is present, but it’s not so obtuse that you lose your neck. It’s actually feminine enough and not too bulky. The skirt hits right at the knees for me, and it has a subtle A-line, not profusely poufy like Alice in Wonderland dresses. It’s casual, one that you can wear flats with and not look too long on the body, and one that you can wear heels with and it would look mismatched. It’s pretty versatile. It’s not too too casual, but quirky enough, with a print that screams unique personality. 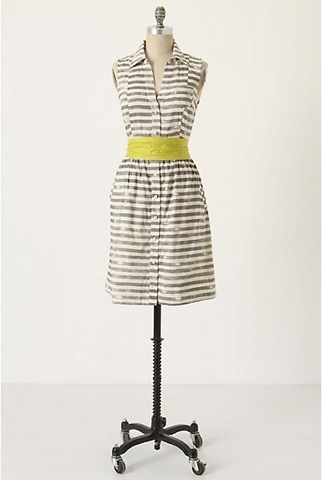 I love it… Really, really, it’s beautiful, with the faded gray and brilliantly contrasting lime green fabric belt that you need to wrap twice around your waist to get that thick ribbon look.